Massarella + Mayware Clay School is a community space offering classes, workshops, facilities, and clay services for anyone serious or just a little curious about clay. We work to accommodate both the beginning and experienced clay artist by offering multilevel classes in a professional studio setting. We are a modern ceramics studio for beginning potters, professional clayworkers, hobbyists, and all around creatives. The Massarella + Mayware Clay School is located just outside of Ojai, CA in beautiful Oak View, CA. We offer multi-level wheel throwing classes, offered in 8-week semesters. Students meet once a week for 8 consecutive weeks. 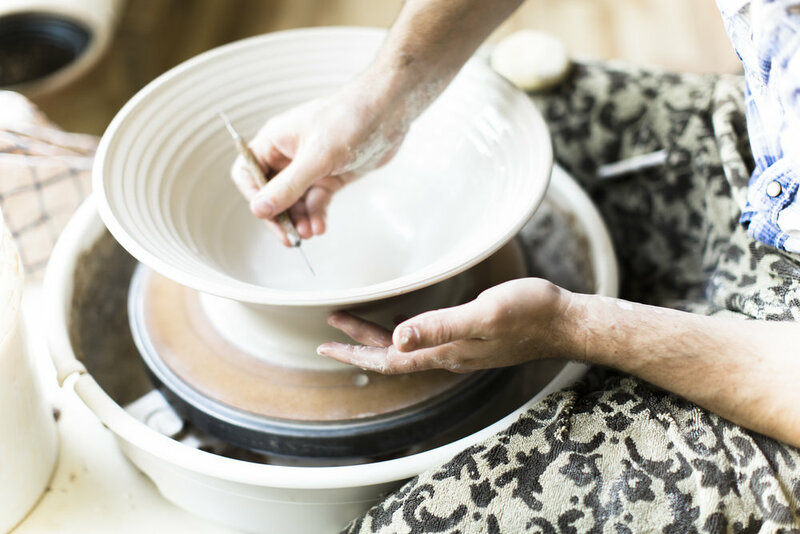 During the 2.5 hour weekly lesson, the first 30-45 minutes the instructor will give a demonstration, followed by individualized guidance as you create with clay. Enjoy a hands-on, creative experience that will take you though all the steps needed to create a finished piece. The first weeks you will work with wet clay, followed by learning to trim and shape the semi- dried (leather hard) clay. After the piece has gone through its first kiln firing, you will learn surface decoration methods. Our final class is a glaze session and potluck where we celebrate what we have made and finish glazing the pieces you've made through out your session. Continue challenging your throwing and design skills with an intermediate or advanced class with distinguished artist Frank Masssarella. Push your creative limits with us by your side to help. Any introduction class is great for those with no experience or looking to get back into it! If you fall in love and want more, we have an ever expanding curriculum with new advanced classes each session. Includes: First bag of clay, glazes, firing, and open studio hours outside of class. One-on-one lessons can be arranged for singles or multiples with Frank Massarella or Jeffrey Ryan May. Kids or adults can enjoy a hands-on event guided by a teaching artist who leads the group in a private 2 hour session. Whether you're interested in wheel throwing, hand-building, candle making or a combination, we'll figure out a program to leave your group happy and a little muddy! Wanna learn, but don't know where to start? We offer several options for the clay curious individuals of all experience levels. give it a try. join our friday wheel and wine. The class runs from 7-9pm. Adults are free to BYOB! Lead by artist Jeffrey Ryan May, the true beginner class is designed for those who may need a little more attention and time to get the basics down. Each class will start with a demonstration followed by guided instruction are wheel basics such as centering. This class is offered Wednesday afternoons from 2pm-4:30pm. Maybe you took a class in college and want to get back into it. Maybe you tried as a kid on your grandma's wheel and are called back again. Whatever your reason, this class is designed for those who have the fundamentals down and are now on to the next stage of the clay process. This class is offered by both Jeffrey Ryan May and Frank Massarella. If you are up for a greater challenge, join Frank's session as it will move a little faster through the steps. This class is being offered Wednesday evenings from 6pm-8:30pm. Lead by renowned artist, Frank Massarella, this class will lead you through more advanced techniques. Weekly demonstrations involving slip design, form altering and advanced glazing techniques with guided instruction. Class is being offered Saturday mornings from 9am-11:30am. Back by popular demand, this class will be offered Thursday evenings from 6pm-8:30pm. Join Frank Massarella as he leads you through weekly demonstrations and guided instruction.